Imagine all of your thoughts as if they were physical entities, swirling rapidly inside your mind. How is it possible that the brain is able to move from one thought to the next in an organized, orderly fashion? The brain is endlessly perceiving, processing, planning, organizing, and remembering—it is always active. Yet, you don’t notice most of your brain’s activity as you move throughout your daily routine. This is only one facet of the complex processes involved in cognition. Simply put, cognition is thinking, and it encompasses the processes associated with perception, knowledge, problem solving, judgment, language, and memory. Scientists who study cognition are searching for ways to understand how we integrate, organize, and utilize our conscious cognitive experiences without being aware of all of the unconscious work that our brains are doing (for example, Kahneman, 2011). Upon waking each morning, you begin thinking—contemplating the tasks that you must complete that day. In what order should you run your errands? Should you go to the bank, the cleaners, or the grocery store first? Can you get these things done before you head to class or will they need to wait until school is done? These thoughts are one example of cognition at work. Exceptionally complex, cognition is an essential feature of human consciousness, yet not all aspects of cognition are consciously experienced. Cognitive psychology is the field of psychology dedicated to examining how people think. It attempts to explain how and why we think the way we do by studying the interactions among human thinking, emotion, creativity, language, and problem solving, in addition to other cognitive processes. Cognitive psychologists strive to determine and measure different types of intelligence, why some people are better at problem solving than others, and how emotional intelligence affects success in the workplace, among countless other topics. They also sometimes focus on how we organize thoughts and information gathered from our environments into meaningful categories of thought, which will be discussed later. The human nervous system is capable of handling endless streams of information. The senses serve as the interface between the mind and the external environment, receiving stimuli and translating it into nervous impulses that are transmitted to the brain. The brain then processes this information and uses the relevant pieces to create thoughts, which can then be expressed through language or stored in memory for future use. To make this process more complex, the brain does not gather information from external environments only. When thoughts are formed, the brain also pulls information from emotions and memories. Emotion and memory are powerful influences on both our thoughts and behaviors. Sensations and information are received by our brains, filtered through emotions and memories, and processed to become thoughts. In order to organize this staggering amount of information, the brain has developed a file cabinet of sorts in the mind. The different files stored in the file cabinet are called concepts. Concepts are categories or groupings of linguistic information, images, ideas, or memories, such as life experiences. Concepts are, in many ways, big ideas that are generated by observing details, and categorizing and combining these details into cognitive structures. You use concepts to see the relationships among the different elements of your experiences and to keep the information in your mind organized and accessible. Concepts are informed by our semantic memory (you learned about this concept when you studied memory) and are present in every aspect of our lives; however, one of the easiest places to notice concepts is inside a classroom, where they are discussed explicitly. When you study United States history, for example, you learn about more than just individual events that have happened in America’s past. You absorb a large quantity of information by listening to and participating in discussions, examining maps, and reading first-hand accounts of people’s lives. Your brain analyzes these details and develops an overall understanding of American history. In the process, your brain gathers details that inform and refine your understanding of related concepts like democracy, power, and freedom. Concepts can be complex and abstract, like justice, or more concrete, like types of birds. In psychology, for example, Piaget’s stages of development are abstract concepts. Some concepts, like tolerance, are agreed upon by many people, because they have been used in various ways over many years. Other concepts, like the characteristics of your ideal friend or your family’s birthday traditions, are personal and individualized. In this way, concepts touch every aspect of our lives, from our many daily routines to the guiding principles behind the way governments function. Another technique used by your brain to organize information is the identification of prototypes for the concepts you have developed. A prototype is the best example or representation of a concept. For example, for the category of civil disobedience, your prototype could be Rosa Parks. Her peaceful resistance to segregation on a city bus in Montgomery, Alabama, is a recognizable example of civil disobedience. Or your prototype could be Mohandas Gandhi, sometimes called Mahatma Gandhi (“Mahatma” is an honorific title). 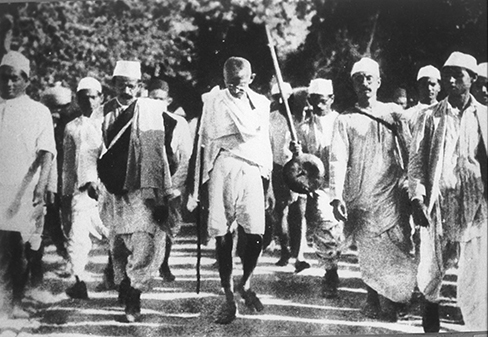 In 1930, Mohandas Gandhi led a group in peaceful protest against a British tax on salt in India. Mohandas Gandhi served as a nonviolent force for independence for India while simultaneously demanding that Buddhist, Hindu, Muslim, and Christian leaders—both Indian and British—collaborate peacefully. Although he was not always successful in preventing violence around him, his life provides a steadfast example of the civil disobedience prototype (Constitutional Rights Foundation, 2013). Just as concepts can be abstract or concrete, we can make a distinction between concepts that are functions of our direct experience with the world and those that are more artificial in nature. In psychology, concepts can be divided into two categories, natural and artificial. Natural concepts are created “naturally” through your experiences and can be developed from either direct or indirect experiences. For example, if you live in Essex Junction, Vermont, you have probably had a lot of direct experience with snow. You’ve watched it fall from the sky, you’ve seen lightly falling snow that barely covers the windshield of your car, and you’ve shovelled out 18 inches of fluffy white snow as you’ve thought, “This is perfect for skiing.” You’ve thrown snowballs at your best friend and gone sledding down the steepest hill in town. In short, you know snow. You know what it looks like, smells like, tastes like, and feels like. If, however, you’ve lived your whole life on the island of Saint Vincent in the Caribbean, you may never have actually seen snow, much less tasted, smelled, or touched it. You know snow from the indirect experience of seeing pictures of falling snow—or from watching films that feature snow as part of the setting. Either way, snow is a natural concept because you can construct an understanding of it through direct observations or experiences of snow. An artificial concept, on the other hand, is a concept that is defined by a specific set of characteristics. Various properties of geometric shapes, like squares and triangles, serve as useful examples of artificial concepts. A triangle always has three angles and three sides. A square always has four equal sides and four right angles. Mathematical formulas, like the equation for area (length × width) are artificial concepts defined by specific sets of characteristics that are always the same. Artificial concepts can enhance the understanding of a topic by building on one another. For example, before learning the concept of “area of a square” (and the formula to find it), you must understand what a square is. Once the concept of “area of a square” is understood, an understanding of area for other geometric shapes can be built upon the original understanding of area. The use of artificial concepts to define an idea is crucial to communicating with others and engaging in complex thought. According to Goldstone and Kersten (2003), concepts act as building blocks and can be connected in countless combinations to create complex thoughts. A schema is a mental construct consisting of a cluster or collection of related concepts (Bartlett, 1932). There are many different types of schemata, and they all have one thing in common: schemata are a method of organizing information that allows the brain to work more efficiently. When a schema is activated, the brain makes immediate assumptions about the person or object being observed. There are several types of schemata. A role schema makes assumptions about how individuals in certain roles will behave (Callero, 1994). For example, imagine you meet someone who introduces himself as a firefighter. When this happens, your brain automatically activates the “firefighter schema” and begins making assumptions that this person is brave, selfless, and community-oriented. Despite not knowing this person, already you have unknowingly made judgments about him. Schemata also help you fill in gaps in the information you receive from the world around you. While schemata allow for more efficient information processing, there can be problems with schemata, regardless of whether they are accurate: Perhaps this particular firefighter is not brave, he just works as a firefighter to pay the bills while studying to become a children’s librarian. Because event schemata are automatic, they can be difficult to change. Imagine that you are driving home from work or school. This event schema involves getting in the car, shutting the door, and buckling your seatbelt before putting the key in the ignition. You might perform this script two or three times each day. As you drive home, you hear your phone’s ring tone. Typically, the event schema that occurs when you hear your phone ringing involves locating the phone and answering it or responding to your latest text message. So without thinking, you reach for your phone, which could be in your pocket, in your bag, or on the passenger seat of the car. This powerful event schema is informed by your pattern of behavior and the pleasurable stimulation that a phone call or text message gives your brain. Because it is a schema, it is extremely challenging for us to stop reaching for the phone, even though we know that we endanger our own lives and the lives of others while we do it (Neyfakh, 2013). Texting while driving is dangerous, but it is a difficult event schema for some people to resist. 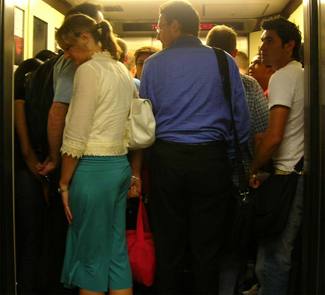 Remember the elevator? It feels almost impossible to walk in and not face the door. Our powerful event schema dictates our behavior in the elevator, and it is no different with our phones. Current research suggests that it is the habit, or event schema, of checking our phones in many different situations that makes refraining from checking them while driving especially difficult (Bayer & Campbell, 2012). 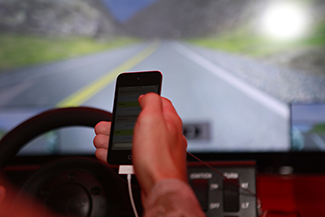 Because texting and driving has become a dangerous epidemic in recent years, psychologists are looking at ways to help people interrupt the “phone schema” while driving. Event schemata like these are the reason why many habits are difficult to break once they have been acquired. As we continue to examine thinking, keep in mind how powerful the forces of concepts and schemata are to our understanding of the world. What is Cognition? by Rajiv Jhangiani, Ph.D. is licensed under a Creative Commons Attribution 4.0 International License, except where otherwise noted.